For many years POIplaza has been a reliable source concerning POIs and speed cameras. This joint project created a very extensive but also partly too complex and confusing global POI and speed camera database. Due to many redundant POI and speed camera categories as well as technical limitations of the POIplaza platform, the data became difficult to maintain for users and operators. The transfer and migration of the worldwide data (exceptions are the following countries: Germany, Austria and Switzerland) into the project POIbase summarizes and compiles the data. This makes it much easier to maintain the data via the interactive map of the POIbase PC application or the web platform http://web.poibase.com. The data are as well available and changeable with the free application POIbase speed camera warner for Android. The data maintenance on POIplaza will cease with the data shift into the POIbase project. In future, therefore, the download of current POI and speed camera data will only be possible via POIbase. POIbase is compatible with most sat navs (vehicle GPS, built-in sat navs, mobile navigation apps) and it facilitates the installation of data. Many sat navs are detected automatically or they can be selected manually. With the aid of POIbase the desired POI categories can be easily compiled and then exported in the appropriate format. 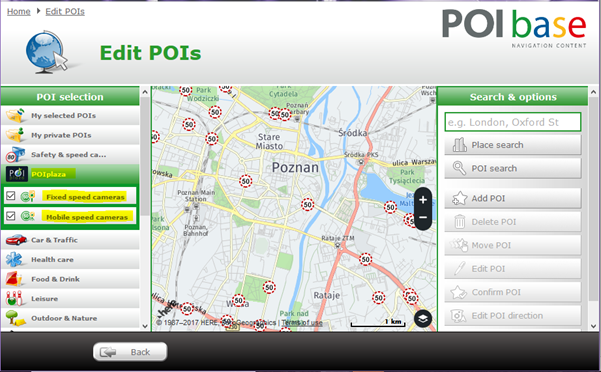 POIplaza's POI and speed camera data is free within POIbase. We are delighted to have the opportunity to continue this great work and we look forward to cooperating with the POIplaza Community! In case of any questions or for other information please visit our forum.